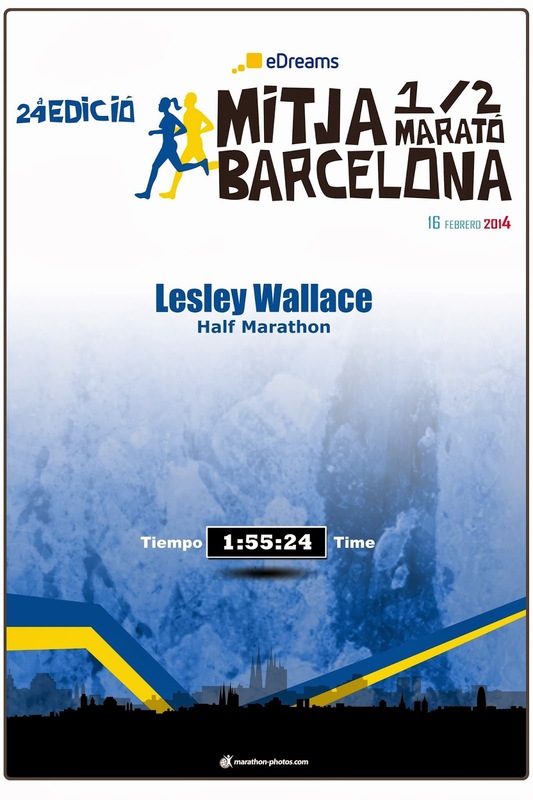 On Sunday the 16th February 2014 I ran in the Barcelona Half Marathon and had an absolutely fantastic experience! I was travelling with my friend Sue and straight after work on Friday evening we headed to the Premier Inn at Liverpool Airport for an overnight stay before our early morning flight! We flew with Easy jet and left Liverpool Airport at 7.10am arriving into Barcelona at 10.25am local time. Due to a tad too much wine the night before we both slept for the entire flight and were feeling slightly more refreshed on arrival. We got the airport bus into the city centre and managed to locate our hotel relatively easily. After checking in we went off to the Expo Centre to collect our race numbers, T Shirts and timing chips! We got a goody bag filled mainly with leaflets and an energy gel but we also got 3 bottles of coconut water! All this was totally stress free and off we then went to investigate where the start and finish of the race was before doing some sight-seeing. On Saturday we resisted the Sangria (actually we resisted all alcohol) carbed up with Pasta and Pizza and had an early night! The day of the race soon dawned, and I had had a surprisingly good night sleep despite the nerves! We had taken instant porridge pots with us for breakfast which due to nerves didn't go down too well. We left the hotel at around 7.30am and travelled the 15 minutes on the underground to the start line. Thankfully the weather forecast was wrong! We had been promised heavy rain and we were delighted to see blue skies instead! We queued up for the portaloos for our nervous wee. Surprisingly there were only 8 loo's for 15,000 runners so we had a bit of a wait! We went straight from this queue to another to drop our bags off and then it was time to head to the pens at the start line. We arrived in the pen at around 8.35am for the 8.45am start! We were at the very front of our pen and nervously waited for the faster zones to set off! Whilst we were waiting they played the song "Barcelona" by Freddie Mercury which sent shivers of anticipation through me! After the 4 faster zones had set off it was our turn! They removed the security ribbon and walked us down to the start. Being at the front of the pen made me feel like an Olympic athlete with all the crowds clapping and cheering us on! Sue and I had agreed to run together so I was very anxious about losing her in all the hustle and bustle as we crossed the starting line. I was determined to get a PB at this race and Sue was determined to help me achieve this dream! Sue is a faster runner than me and was happy to pace me. Thankfully I kept her in my sight until it all calmed down, everyone spaced out and then I was able to run alongside her. I was slightly concerned that I would go out to hard and then crash but I was willing to risk it to see how far I could push myself! I kept the thought of my "I run 4" buddy Haddie encouraging me firmly in my mind! I could do this for her as she works so hard on a daily basis! I was wearing my Garmin watch but had promised Sue I would not to look at it during the race as this always affects me mentally! When I see a fast pace on my watch I instantly panic and think "OMG I can't run at this pace" suddenly feel tired and slow down! I was putting all my faith in Sue to get me over the finish line in a sub 1.57.54 minute time! Initially I found it difficult not to have a little peek but after about 4 miles I really didn't want to know what pace I was doing! This was my 10th Half Marathon but it was my first one abroad and my first one marked out in kilometres instead of miles. This seemed to make the distance go quicker as we seem to very quickly come across the next kilometre marker point! Sue kept checking my well-being with the words "Comfortable or uncomfortable?" when I answered "comfortable" she replied "we can go faster then!". There was a water and energy drinks station at 5k where we slowed to collect a bottle of water. By the time we passed the 10K timing mat the sun had come out and the day was starting to warm up. There was lots of encouragement from the crowds at this point too and another water station. I took this opportunity to consume an energy gel and prayed this extra fuel would get me through to the finish! We had been told by several people that the first half of the race was hilly so I said to Sue "have we done the hills now?" and she replied "I think so!" As far as we were concerned it had been relatively flat! That's one advantage of living in a hilly area - very few places have hills like us! Our pace for the first 6 miles went like this: 8:20, 8:26, 8:22, 8:42, 8:04, 8:37! Thankfully I was blissfully unaware of doing a 8:04 minute mile as this might have been enough to finish me off! I was impressed with how all the runners must have predicted correct finishing times as we didn't have the usual dodge people who are walking problem! The pace for the next 3 miles went like this: 9:05, 8:55, 9:00 minute miles. Anyhow all was going well up til this point and I was still keeping alongside Sue when she announced that she was desperate for the loo. My initial thoughts were "Don't leave me" as she said she was going speed up to go to the loo's at the 15K point and made me promise not to slow down and she would catch me back up! I waved her off as she disappeared into the distance leaving me alone! At this point I could have looked at my Garmin as no one would know, but by now I was too scared to look! I passed the loo's keeping an eye out for Sue but couldn't see her. She had told me to keep to the right hand side so she could find me but unfortunately that was the end of us running together! My first mile alone was my slowest! I did a 9:14 min mile pace but had a severe word with myself when I realised I was slowing! I remained optimistic that Sue would reappear and kept my eyes peeled in case she tried to sneak past me! Whilst running along the seafront the sun became really hot and I started to feel like I was overheating! I tried to stay focused and keep the pace up and not panic! I thought of Haddie and smiled to myself at the thought of her big smile! I managed mile 11 in 8:56, mile 12 in 9:05 and mile 13 in 9:00. Heading towards the final straight I was very confused! There was lots of blow-up "arches" going over the road in the distance but which one was the finish?! The one I thought was the finish turned out to be the 20K marker point which meant I still had 1K to go! By now the crowds were getting denser and the cheering was getting louder so I tried to make it look easy as I "sprinted" to the finish! I heard the "Beep" of the final timing mat and at last I got to look at my Garmin! I could have cried when I saw 1:55:27 - had done it! I passed through the finish collected a bottle of water and a banana and was presented with my medal! I loved the way it was actually hung round my neck rather than just given to me in a bag! I felt very honoured and proud! I decided this was the best place to try and find Sue so hung around and about 45 seconds later we were reunited! Big hugs ensued when she realised I hadn't blown it on my own and I had achieved my goal! However ... If she had a better bladder what would I have got?!!! One bonus to her having a weak bladder - I BEAT HER!!! We were very good at this point and did some stretches before heading to collect our bags and then went for a free massage! I had a lovely although ever so slightly painful leg massage from a nice looking young Spaniard! Afterwards we headed back to the hotel showered and got dressed up before hitting the town at 3pm for food and Sangri ... and I will leave the story there!!! 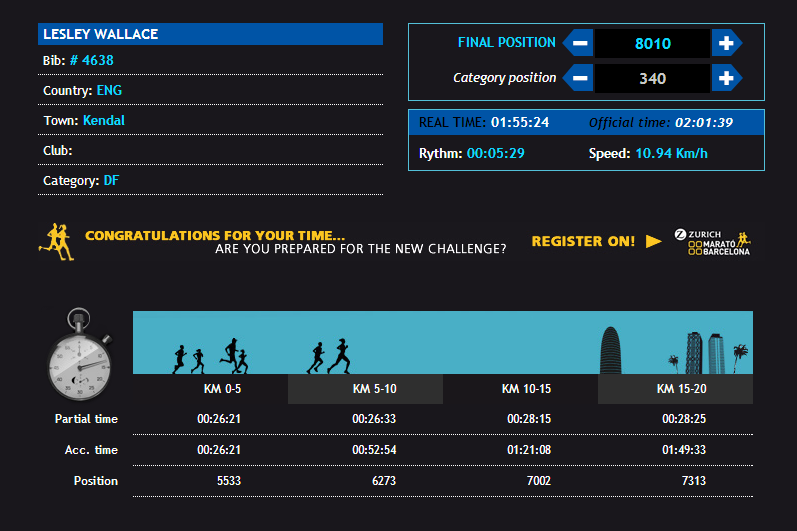 The official results came through and had me 3 seconds faster than my Garmin at 1:55:24! All in all a fantastic City, fantastic people, a fantastic experience, and a fantastic race!! You can see the route and my Garmin stats here. This was my 3rd race for Haddie and my second PB! She must have a very positive effect on my running! Thank you Haddie for supporting me every step of the way! Bring on my next race abroad!